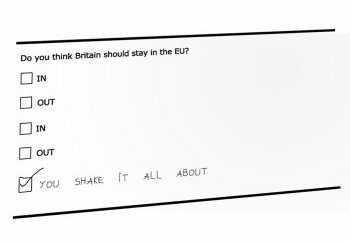 Misprint in latest Brexit polls cause 13% of people to vote for "shake it all about"
The latest Brexit poll, undertaken by Garamond Funeral Services, Cheshire, has revealed that the electorate are becoming increasingly confused by the balloting process. A misprint in the poll caused thirteen percent of voters to answer the poll by adding their own written response. The off-the-cuff responses -variations on "shake it all about", a reference to the song Hokey Cokey, popularised in the 1980s by bands The Snowmen and Black Lace - have created tension amongst those both for and against Britain leaving the EU. Some have seen the spontaneous ribaldry as the public showing its irreverence towards complex issues, while others have suggested that it is likely to now cause copy-cats to spoil their actual voting papers in the real vote later this month. "This worries me," said Boris, "because I didn't think anyone could be so mangled up inside as I am. My brain is a fish by the way, did you know? And my fish are my sandals. It's all fairly normal in my house. Don't worry about me. I'm alright. So long as I have my wits about me the party's in good hands. I mean, Mr Cameron's hands, of course. Dear me." "The nature of this poll suggests, to me, that absolutely, what's really important, to the British people, is the preservation, both in common society, and in all those other places where I have no right being, nor have ever really been, of the ongoing pursuit of absolutely - now, look, the truth is we all know that some movement either way is absolutely natural and normal - but the ongoing pursuit of responses that are longer and lengthier and wholesome in both their nature and style is critical - absolutely - to the number of punctuation marks one would have to use in order to accurately account for a single sentence that I might choose to construct in answer to the relevant question. In short - yes." Prior to this latest development, most polls were predicting that Leave were likely to have their way, with a ten point lead ahead of Stay. Some pundits are suggesting that these joke responses may cause turnout for the June 23rd poll to be an all-time low, with the possibility of zero turnout in some areas.